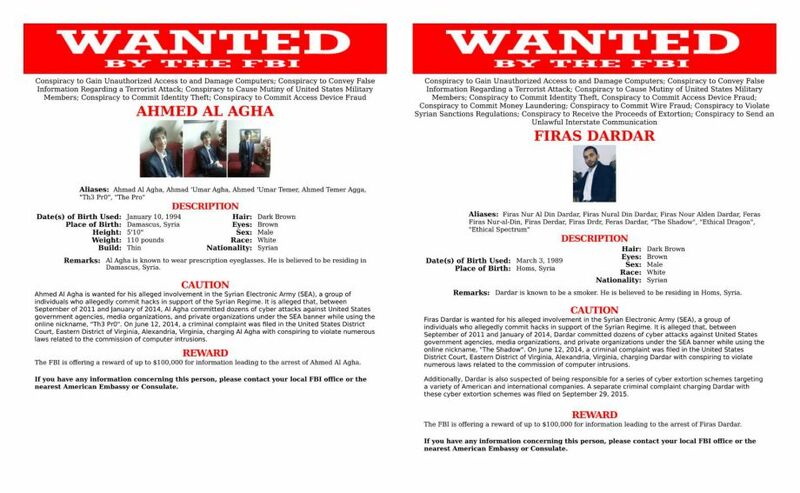 The FBI added two Syrians to their Cyber's Most Wanted list. Three members of a Syrian hacker collective that hijacked the websites and social media platforms of prominent U.S. media organizations and the U.S. military were charged today in federal court with multiple conspiracies related to computer hacking. In two criminal complaints unsealed in the Eastern District of Virginia, Amad Umar Agha, Firas Dardar, and Peter Romar were charged with criminal conspiracies related to their roles targeting Internet sites—in the U.S. and abroad—on behalf of the Syrian Electronic Army (SEA), a group of hackers that supports the regime of Syrian President Bashar al-Assad. The affected sites—which included computer systems in the Executive Office of the President in 2011 and a U.S. Marine Corps recruitment website in 2013—were deemed by SEA to be antagonistic toward the Syrian government. According to the charges, Agha, 22, known online as “The Pro,” and Dardar, 27, engaged in a multi-year conspiracy that began in 2011 to collect usernames and passwords that gave them the ability to deface websites, redirect domains to sites controlled by the conspirators, steal e-mail, and hijack social media accounts. To obtain the login information they used a technique called “spear-phishing,” where they tricked people who had privileged access to their organizations’ websites and social media channels into volunteering sensitive information by posing as a legitimate entity. 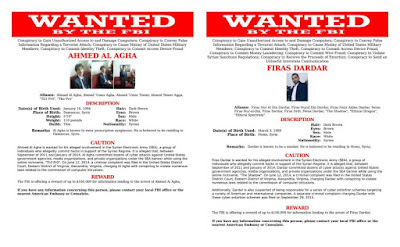 The FBI today added Agha and Dardar—both believed to be in Syria—to its Cyber’s Most Wanted. The Bureau is offering a reward of up to $100,000 each for information that leads to their arrest; anyone with information is asked to contact the FBI or the nearest U.S. Embassy or consulate. Tips can also be submitted online at tips.fbi.gov.